Цветы, возложенные у телевизионного центра "Останкино" к фотографиям журналистов, погибших при крушении самолета Минобороны РФ Ту-154 у побережья Черного моря в Сочи. DNA testing experts have identified more than 70 victims of the crash of Tu-154 aircraft operated by the Russian Defense Ministry over the Black Sea, some sources in the Forensic Medical Examination Office informed TASS on Jan. 13. "To date, the process of identifying more than 70 victims has been completed. Their relatives have been informed with the results of the examination," one of them said. According to the source, work to identify the remains of the passengers continues. Among those identified are Executive Director of the Spravedlivaya Pomoshch (Russian for Fair Aid) charity fund Elizaveta Glinka, known to the Russian public as Dr. Liza, head of the Defense Ministry’s Culture Department Anton Gubankov, Artistic Director of the Alexandrov Ensemble Valery Khalilov, 10 crew members and nine journalists. The source added that the identified victims are expected to be buried on Jan. 14, 16 and 17. 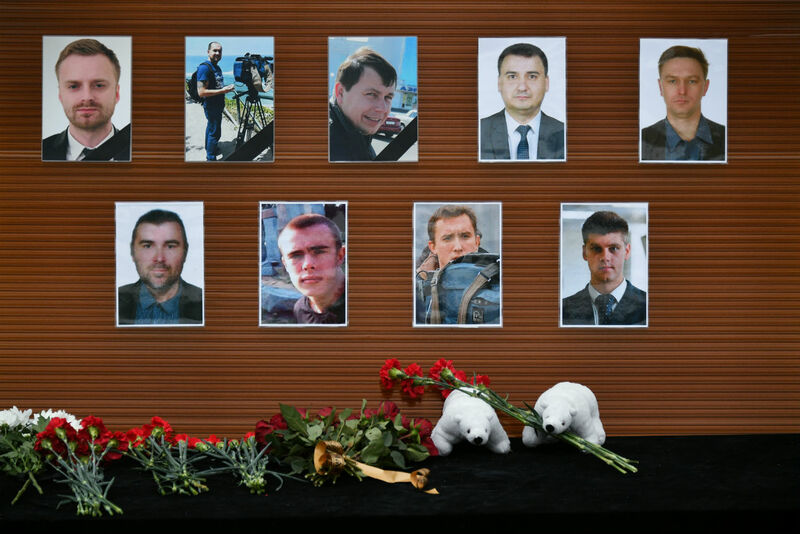 "According to preliminary information, 50 victims will be buried at the federal Military Memorial Ceremony in Mytishchi, Moscow region, where Anton Gubankov’s assistant, Oksana Badrutdinova, was interred earlier," the sources said. Meanwhile, a source close to Elizaveta Glinka told TASS that she will be buried at Novodevichy Cemetery in Moscow. "The funeral is expected to be held on Monday, Jan. 16," the source said. Tu-154 plane crashed in the early morning hours of Dec. 25 shortly after taking off from the Black Sea resort of Sochi. There were 92 people on board the aircraft, none of them survived.